A rapidly growing number of individuals are participating in martial arts competitions. This is especially evident in the art of jiu jitsu where matches are being held all over the world. Effective performance requires a combination of strength, speed, stamina, and strategy. In order to compete at the highest level, one must be at the top of their game in each of these aspects. But few are aware that one of the biggest, yet most simple training techniques is right at their fingertips: hydration. 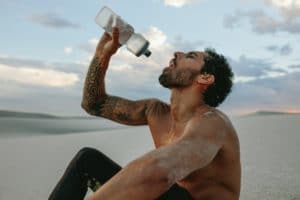 The importance of hydration in the world of martial arts competition and the not-so-obvious benefits it provides to one’s athletic performance are enormous. It might not seem like it, but hydration is the key factor many are missing in order to reach their ultimate performance potential. Let’s state the obvious. 70% of the human body is water. So clearly water is necessary in order for the body to function correctly. Water provides an endless array of physical must-haves. It is essential for the kidneys to operate. It protects the joints, carries oxygen throughout the body, prevents headaches and migraines, and flushes out body waste by aiding in digestion. Water is essential to keeping the body healthy, agile, and running smoothly. But most of this is all information you have probably read or heard before. Let’s get to the good stuff! A martial arts match is extremely demanding, and due to sweat, the body’s water retainment can lower substantially. If dehydrated, this can quickly make every action feel more difficult and laborious to perform. Staying hydrated greatly boosts energy, eliminating fatigue and grogginess. When it comes to hand to hand combat, getting worn out presents problems. One must be fully attentive and aware at all times, because just a moment of hesitation can affect the entire match. If you want to have a one-up against your opponent, becoming more hydrated will truly take you the extra mile. You may not even realize you are dehydrated until you make the effort to become hydrated. Once drinking water becomes a habit, the results will show in your increased alertness and intensity in physical performance. Mental alertness is equally as vital as physical alertness. Although the strength and physical ability aspects are huge components of martial arts competition, if one wants to truly understand the sport they must understand the strategic component as well. A jiu jitsu match, for instance, is like a game of chess. One must be constantly devising a plan and thinking out their next move. But if the senses and thoughts aren’t at their sharpest, an athlete is suddenly at a major disadvantage against an opponent who feels completely focused and alert. The brain is greatly affected by the body’s amount of water intake. In fact, brain cells need twice as much energy provided by hydration than any other bodily cells. Studies have proven that even a very moderate amount of dehydration can impair how quickly and keenly the brain works. Hydration proves to greatly improve brain power and better all cognitive actions. When the brain is working with plenty of hydration, it is at its peak, allowing you to strategize more rapidly, think clearer, be more aware of your surroundings, and focus much more easily.